← How to Find Out If An Airport Has TSA Body Scanners? Banks are getting hard with new regulations which are hurting their bottom line. Banks offered free checking accounts while covering that cost with overdraft fees, debit card interchange fees, etc. But, new regulations are putting a cap on overdraft fees and interchange fees that is going to affect their important revenue stream. So, how is that going to affect us? You guessed it. ‘Free checking accounts’ with no minimum balance or monthly fees are going to become a rarity if it hasn’t already. So, while I was doing a financial house cleaning over the holidays I started looking around for checking account alternatives than the ones I have. 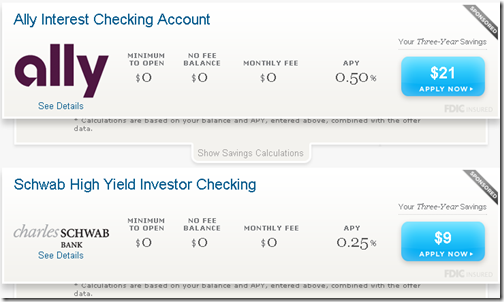 I came across this tool in Mint.com which lets you compare checking accounts (and other types of bank accounts) with a nifty tools fitted with sliders and auto-updating pages. Once you select your values (financial not moral), Mint shows you the banks that fit your terms. You can also provide an average balance you usually have and your current APY. Then you see how much you save/lose by switching to a new account. maximum $9 per day overdraft fees – yes $9! Doesn’t this sound too good to be true? Guess what, I am this close to closing my main checking account and moving my direct deposit to Ally. 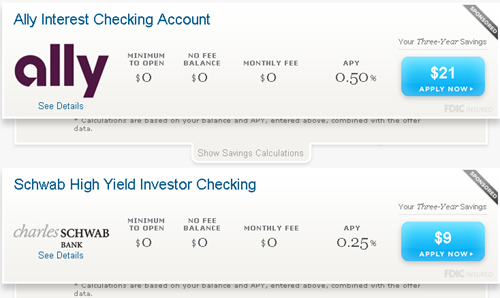 If the $9 overdraft fee didn’t catch your eyes, I am sure the 0.50% interest checking did. Yes, that’s higher than most interest checking and even some savings accounts. I am not getting compensated to write this. In fact, I am going to do a little bit more research on this bank before switching. If any of my readers here have used it or use them, please let me know in the comments. Mint has posted a list of best checking accounts of 2010 and undoubtedly Ally ranks amongst the top followed by Charles Shwab. Here is another tool I reviewed earlier to compare bank accounts – Find Better Banks (review). It has even more options to play around and more detailed than the Mint.com tool.